pearl onions, originally uploaded by shaunaforce. For months, my dear friend Gabe and I did not talk on the telephone. It’s not because he lives in New York and I live in Seattle, a thousand heartbeats of miles away from each other. It’s not because he’s recording an album while he’s cutting his latest short film, while I am writing an entire book in four months at the same time I have fallen hopelessly head over heels in love, more deeply than ever in my life. Years ago, that would have kept us up talking, late into the night, the phones growing hot upon our ears. Why don’t we talk to each other, then? Because we have so much to say. The longer we go without talking, the more we have to say to each other. We always could talk on the phone for an hour or two, and still just feel as though we were warming up. But these days, with the sunlight shifting so fast in both our lives, we could talk for ten hours and not be done yet. When he flew out for my birthday, we promised we would converse on the phone soon. We promised to not let the stories clog up our minds until we could no longer remember them. We promised to talk. Of course, it has been months since then. We haven’t had a full conversation yet. How have we been sustaining our friendship? (After all, “Grief appears when communication fails.” — Karl Jaspers) We have been talking in short bursts. He emerged from his dungeon of an editing room and called me to tell me about the frustrating shots that were out of focus. I drove to the restaurant to pick up the Chef at the end of the night, put that dratted headset on, and called Gabe from my cell phone. He was in the Bay Area, for a dear friend’s wedding, and we talked fast, for fifteen minutes, about her love. We leave extensive voice mail messages for each other. We feel part of each other’s lives. I don’t know why I have to keep learning this. It used to be, I would keep voluminous journals, for months on end. Faithful to the page, I wrote out every day as though it could save me. However, if life intervened, and I missed a day or two, I quickly let the blank space reign supreme. Why? Because I felt this responsibility to make up for lost time. To compensate for my silence with brilliance, or at least twenty pages of writing. To make amends with that next piece. It took me years to realize nothing had to be perfect. Just to drag the pen across the page was enough. For years, I swore to myself that I would start a regular exercise program. And to make up for the years of being a lollygag on the couch, in my early twenties, I would do more. I would run a marathon! Do yoga every day! Stand on my head to increase my circulation! Lift weights! Look as good as the girls in magazines and feel even better! What did that mean? I stayed on the couch, thinking about starting the next day. The more cluttered the living room grew, the more I had to devote the entire day to cleaning everything, waxing the furniture, making the windows squeaky clear, and finally find the Feng Shui arrangement of my furniture. And then, of course, I lay on the couch, imagining myself picking that towel off the floor, over and over. These days, however, I fill a page every day with little notes about the food the Chef and I are eating and cooking, funny things my nephew says, and the cast of light through the window in the late afternoon. Most of it is not in complete sentences. However, every day, there is a new page for instigating memories. In the mornings, the Chef and I drive to the Arboretum, lace up our shoes, and take a slow walk/run through the leafy green. I’m slow. I complain, sometimes. I’m not going to be running any marathons -- perhaps ever -- but I’m thrilled to be ambling down the grass without my knees hurting. All my life, my knees were creaky. I could tell you when it was going to rain the day before it started. But since I stopped eating gluten, I have no creaky joints. And so, I am trying to run, for the first time in my life. I am finding my own stride. When I grow tired and sweaty, and think I cannot run another step, I look ahead of me and see the Chef, haloed by sunlight, surrounded by trees with red and orange leaves, and I just have to keep going. And right now, the living room is just neat enough to not goad me into thinking I should clean it, instead of writing a book. You see, I’m writing a book. Every day, I delve into the unknown and come up with some sentences I like. I can’t promise greatness, but I am making progress. Last night, I finished the rough cut of the fourth chapter, which puts me 1/3-of-the-way through the manuscript. I’m thrilled. Last night, I arrived at the Chef’s restaurant and jumped and down in front of him, then did a little soft shoe dance on the sidewalk in my red clogs. I can’t wait for you all to read it. The only way I can write an entire book in four months is to remind myself that I am writing for all of you reading this now. And to let myself be imperfect. In the last weeks before I deliver the manuscript, I will be editing and revising until I am nearly going blind. But for now, I am somehow writing in short bursts and potent images, like my brief conversations with Gabe. As I used to tell my writing students — and now I have the chance to practice it, instead of merely talking it — the secret to writing is to write. Every day. Without fail. Freely, with arms wide open. Except, lately, I’ve been missing this blog. I haven’t been here every day. I haven’t been taking slow steps. I’ve barely been writing here at all. But part of this lies with me. The more aware I am that I am writing a book, the more I feel I must write something profound for this site. Something soaring and simple, sarcastic and sublime. And the fact is — I just don’t have the time, these days. Besides, as I have realized, I miss too much when I try to tie up things neatly. These days, I am learning so much about food that I cannot possibly convey it all into my manuscript. I want to share it with you instead. I’m making cookies, and finding new ingredients that immediately become favorites, and eating gluten-free products that fill my belly, amply. There is no room for all these digressions in perfect little posts. And so, you’re going to see a few changes around here at Gluten-Free Girl. In a few weeks, you might just see an entirely new look. But starting today, I’m going to be posting daily again, the way I did when I first began. But most days, I won’t be posting long, elaborate essays. Sometimes, it might be a recipe without an explanation or description. It might be a story I over-heard at the farmers’ market. I might share a cooking tip, a quote, a paen to autumn vegetables. Most of the time, it might just be a photograph of food. The other afternoon, I was sitting in the Chef’s restaurant, writing on the laptop while he made veal stock in the kitchen. As the smells waftted to me, and I was just about to ask him to tell me exactly how to do that at home, he came out from the kitchen with a strainer full of pearl onions. He had just blanched them, and he needed them to cool before he moved onto the next step of a recipe. Casually, he lay them down on the rack by the window. For a moment, I had no words. The sun shining on the onions was so limpid and kind that I had to stop. Without thinking why, I fished around in my bag for my camera. Within a moment, I had taken this photograph. I love this photograph. I don’t even know why. It just feels like this autumn to me. You see, the thing is, I don’t have a recipe involving pearl onions, at the moment. I could concoct one, just to use this picture. Instead, I offer it to you. Make of it what you will. So, come back every day, and discover what I have to share. I’d love to hear from you, too. If you have a great recipe for pearl onions, let the rest of us know. If not, just enjoy. It feels good to be back. Welcome to my imperfect digressions. Most of attempts at daily journaling have been derailed by the single missed day that stretches into weeks/ months/ years. I struggle with the same issue with my blog; I've resorted to posting mostly photos during an intensely busy period at work. The onions are lovely. I look forward to seeing where your daily digressions lead. lovely post and i am looking forward to your daily digressions. imperfect = perfect, i think, especially where digressions are concerned. I am a great fan of Julia Cameron (The Artists Way, The Right to Write etc) who says to write every day and 'if you write, you are a writer'. I guess whether it's a blog, a journal or a magnus opus...it's still writing and we are writers. But for you to write on a publishers deadline AND blog - now that is very generous. Thanks. I have never been able to keep a daily journal. Part of starting a food journal is to give myself a more limited daily writing assignment. If you put a pen and paper in front of me and say "write about your day, your observations, your feelings" I draw a blank. But put a computer in front of me and say "write about what you ate today"... Well, that I can do! I'm happy to hear you are back even as busy as you are!! I can't keep a journal longer than 2 minutes, even tracking my son's food allergies. I'm hopeless when it comes to writing, so I just post recipes. No famous words from my writing, but that's probably why I love to read everyone elses blogs!! What a beautiful post, full of light and onions! I'm so glad I'm subscribed to your page, so I won't miss your offerings, daily, imperfect, or otherwise. I needed to see and read those pearls today. There's too much I'd like to say by way of response, so I'll just say YES! Your digressions are a treat to digest. 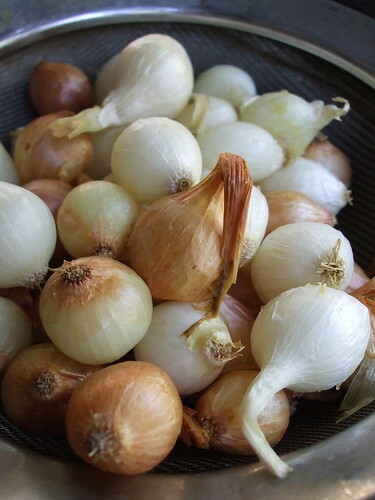 Pearl onions are perfect as creamed onions. My grandmother and I always used to fight it out for the last scrapings in the dish. The basic idea is a white sauce (gluten free flour!) which uses some of the water from cooking the onions instead of just milk - with gruyere cheese, maybe a bit of old cheddar, mustard powder, cayenne, and then either crumbs with butter on top to get crispy, or more cheese to brown...luxury dish! I was going to mention creamed onions and girl upstairs beat me to it. I like them best the way we have them at Thanksgiving (and only then, alas! ): Pearl onions and green peas in cream sauce. Like other only-at foods (charoses or fruitcake, anyone? ), I never think of preparing them myself in say, April, or October. Half of me says: "No! Don't waste time on the blog and let your wonderful book suffer." The bigger half says: "Yay! Tell us all about it! Post post post!!" oh. my. gosh. I adore your writing. It seems as if you're sitting in my living room chatting with me.... but alas, you're writing from across the country. Here I thought I was the only one who would sigh over my living room's untidiness and then zealously clean it to perfection...for a day..then it would be back to the endless sighs. I too feel the weight of "I should be part of a rigorous excercise program that will better my health." And today, before reading this post, decided to do something radical (for me) and just go for long walks to enjoy the fall weather and walk because it feels good just to walk - or maybe run! I have journaled off and on for 10 years, and now haven't written a page since March - when I met someone who occupied my time and now that's over. Thank you for sharing your love story. Happy five month anniversary! What I went through wasn't fall-into-place easy but more of a struggle to make things fit, to make it right. Now after reading your story, I have hope again that when it's the right man, it'll be recognizable - tangible perhaps. I found your blog because an aunt and a cousin need to eat gluten free and I thought of them. But I'm going to read your blog - for me. Now that I know you're writing a book, I cannot wait for it to be published. But since I stopped eating gluten, I have no creaky joints. i have creaky joints and would like to know if cutting out gluten completely would help them. i eat such tiny amounts of gluten sporadically now that i didn't think my problem was gluten. but last night i ate 10 huge sami's rice crackers (not gf) and today i felt like death. how long after you went gf did your creakiness stop?